“We had a dog that thought it was the grass and walked straight into the lake,” Roberts recalled. Louisiana Rep. Patrick Williams (D-Shreveport) is trying to draw attention to the invasive aquatic weed giant salvinia that continues to clog many waterways in the state. Williams said his constituents want to see results that go beyond chemical sprays and weed eating weevils raised in university research labs. (Phys.org)-A weevil that feeds exclusively on giant salvinia has successfully destroyed about 150 acres of the invasive plant this summer on B.A. Steinhagen Lake near Woodville in East Texas, according to personnel involved in a statewide giant salvinia management program. TEMPO Interactive, Jakarta:The water quality of Ranu Pani, a lake which lies at the foot of Mount Semeru in Lumajang, East Java, is steadily deteriorating due to wild vegetation and increased sediments setting in. If neglected, within 20 years, this lake will no longer exist. Bay of Plenty residents are being urged not to share or grow banned aquatic pest plants which pose a “huge” risk to the region’s waterways. The Ministry of Primary Industries and the Bay of Plenty Regional Council is particularly concerned about salvinia, also known as kariba weed, and water hyacinth. 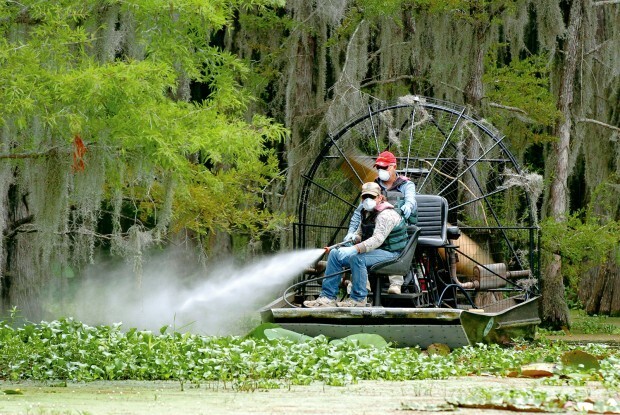 KARNACK — Cypress Valley Navigation District officials on Monday approved spending $75,000 from Texas Parks and Wildlife for its 2012 invasive aquatic plant spraying program. Caddo Lake Initiative is getting a $100,000 grant from the National Fish and Wildlife’s Pulling Together Initiative to help fight the invasive weed known as Giant Salvinia.